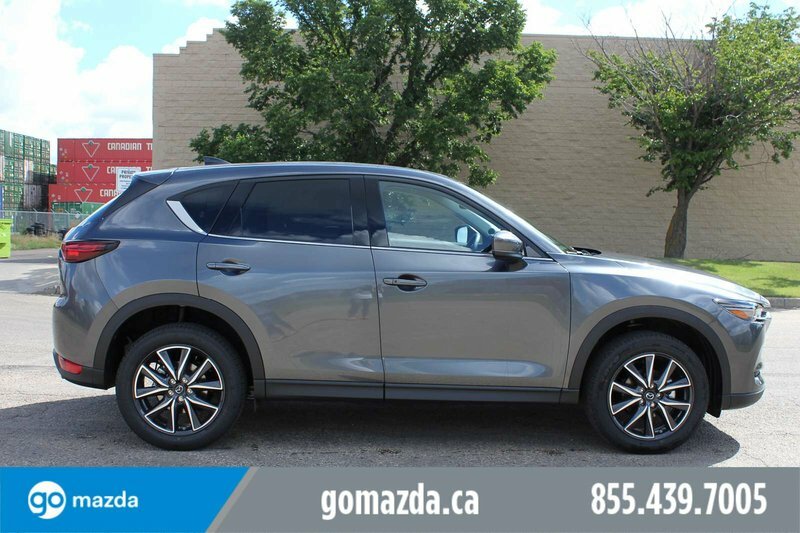 The AJAC Award Winning 2018 Mazda CX-5 GT Tech is our top of the line model. Motivated by a 2.5 Litre 4 Cylinder that offers 187hp while matched to a 6 Speed Automatic transmission. You'll love the handling of our All Wheel Drive CX-5 and conquer the road with 7.9L/100km. Brilliantly engineered, our CX-5 GT is the pinnacle of aerodynamic design with dual exhaust, a rear spoiler, privacy tinted rear windows, and LED headlights with signature lighting. Slide inside the well-appointed cabin that has been masterfully designed to meet your needs with a power sunroof, heated leather seats with driver memory, dual-zone automatic climate control, keyless ignition, a heated and leather-wrapped steering wheel with mounted cruise and audio controls, and a 40/20/40 split-fold rear seat. Get acquainted with the Navigation system and find your favorite song on Bose audio as you set off. The GT Tech comes with vibrant heads up display, Mazda radar cruise control, lane departure warning with lane keep assist, smart brake support, and adaptive front lighting.